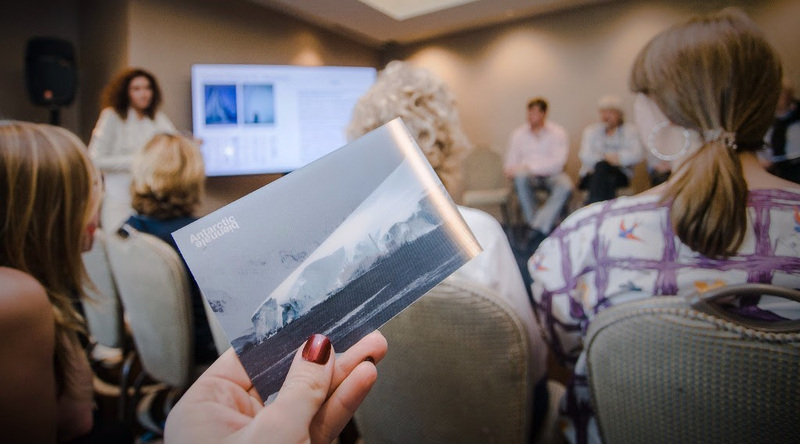 On December 1st, the results of the Antarctic Biennale Open Call for artists under 35 were announced during Art Basel Miami Beach. The first prize was an invitation to join a group of distinguished artists, researchers and visionaries of all ages on an expedition Antarctica in March 2017, to realize a proposed artwork. The winners are Sho Hasegawa (Japan) and Gustav Dusing (Germany). The decision to award the first prize to two artists, on the part of the international jury, was a surprise. The event was held with the support of the Antarctic Biennale Open Call partner BMW Group. Thomas Girst, Head of BMW Cultural Engagement and honored guest of the ceremony introduced the Antarctic Biennale project and its founder and commissioner artist Alexander Ponomarev to the international press pool. According to Mr.Girst international projects like that are important for understanding the role of art in the nearest future. The Open Call results were announced by Alexander Ponomarev. The live streamed event on the project’s Facebook page gathered numerous viewers from all over the world. First announced in August 2016, the Open Call received over 500 applications from 59 countries. The most active applicant countries were the USA (72 applications), UK (45 applications) and Russia (38 applications). The top 10 active participating countries also included France, Germany, Italy, Canada, Australia, Turkey and Mexico. The winner and finalists were selected by an international jury comprising the Commissioner of the Antarctic Biennale, Alexander Ponomarev, and members of the Artistic Advisory Board: president and director of the Sharjah Art Foundation, Sheikha Hoor al-Qasimi; art critic, curator, author Hans-Ulrich Obrist; architect and artist Hani Rashid; and Antarctic Biennale Organizing Committee Member and independent curator, Nadim Samman. The winning project by Sho Hasegawa “The Winter Landscape” is an open-ended project, incorporating research from his previous expeditions and an experiment that combines drawing, ice skating and electricity. Gustav Dusing proposed ‘Shelter’, a temporary architectural structure made of thin ice. According to the author’s description, his project builds upon research by the Swiss engineer Heinz Isler, who pioneered modern experiments with ice-building. As Nicolas Iljine, advisor to the General Director of the State Hermitage Museum, cultural consultant and member of the Antarctic Biennale Board of Trustees said – the Antarctic Biennale concept had an inspiring influence on the vision of applicants. All received projects were original and displayed a sincere attitude towards Antarctica’s unique context. Throughout, proposals demonstrated sensitivity one of the key parameters of the Antarctic Biennale open call – leaving no trace behind. The intention of the Open Call competition was to give an opportunity to emerging and mid-career artists under 35 to be heard. Commissioner Alexander Ponomarev said: “We need more brave and breakthrough ideas for humanity, addressing living together in the future – sharing common spaces. Having an emerging artist join an experienced and established group during this expedition is very important for the project. It a once in a lifetime chance for the winners – and one they deserve”. The biennale’s final artist list is set to be announced in February 2017. A few names officially unveiled to date: Hani Rashid (Canada/USA), Matthew Ritchie (UK), Tomas Saraceno (Argentina/Germany), Paúl Rosero Contreras (Equador), Juliana Cerqueira Leite (Brazil), Julian Charrière (France/Switzerland), Zhang Enli (China). In addition to the winning artists, the names of 15 finalists were also announced at the event in Miami. These artists will be invited to exhibit their artwork at the Antarctic Pavilion during the 57th Venice Biennale of Art 2017 – Andreas Lutz (Germany), Ariel Spadari (Brazil), Bridget Steed (UK); Jacob Harper (USA), Jasmin Blasco (France), Kim Sheppard (Canada), Louise Oates (UK), Matilde Solbiati (Italy), Meadhbh O’Connor (Ireland), Stefan Laxness (Iceland), Stephanie Roland (Belgium), Sybren Renema (Netherlands), Tom Blake (Australia), Valentine Siboni (France), Winston Chmielinski (USA). artistic, scientific and philosophical methodologies, creates a supra-national platform for interdisciplinary and intercultural dialogue. The Antarctic Biennale departs from standard exhibition models. It is a creative journey, expanding the parameters of what art can be today. The Antarctic Biennale expedition aboard the research vessel “Akademik Ioffe” begins in March 2017 and will last for twelve days. It involves a hundred people from all over the world: artists, architects, researchers, and philosophers. The biennale’s onboard program includes artistic and scientific discussions, performances, poetic and philosophical readings, and screenings. The Antarctic Biennale is an international sociocultural phenomenon that incorporates artistic, scientific and philosophical methodologies, creates a supra-national platform for interdisciplinary and intercultural dialogue.